I don't write a ton, so I've never really understood or experienced what a case of writer's block feels like. Until now. The deadline for the next two books I'm writing with Marko is a month away and I'm not finding my groove, which is weird because I consider myself quite groovy! I've been getting to Starbucks by 6:30 or so every morning but just can't get into a good rythm. I'm not panicking yet, but I can see it coming. I don't know if there really is a 'record' when it comes to blogging, but if there is, I want this to be on it: When I blog or post remarks on other blogs, I do so in an 'I'm just thinking out loud' posture. I realize that what I write does, in fact, represent what went through my head but what goes through my head doesn't always represent something that stayed in my head for very long. So if I ever write anything dumb (as if I haven't already a hundered times), or controversial (which isn't typically my nature), or that you disagree with (which hopefully WILL happen) I will never say I didn't write it. I will, however remind you that 'the record' states that such thoughts are really just that, and not much more. - John Elway is the greatest QB to ever play the game. - Living in California justifies the high price of homes. - It's weird that a massive corporation like Walmart gets slammed by the media and those on the left while a massive corporation like Starbuck's goes untouched. I guess giving .01 per bottle of water sold to Africa gets them off the hook. That, and the the possibility that the real reason is because people are terrified a Walmart may open in their posh neighborhoods and attract the type of worker that they supposedly care so much about. This could cause them to gag on their grande frap. After all, big business is only bad if it's a big business that you don't frequent. - Elmo is the best children's television character ever created. - Neither the church nor youth ministry is in as big a mess as some think it is. - The reason fewer and fewer people believe in truth is because fewer and fewer of us are willing to define and defend it. - My buddy, Gary Hunt, who is in his late 50's and still in full-time junior high ministry is the greatest youth worker that nobody has ever heard of (except of course the students in his community that he has been faithfully serving for so many years). - Today is a great day to grab a Starbuck's and head off to Walmart to shop for jeans. - Sometimes Life Repeats Itself. Lesson Topic: So, What's a Christian? This past weekend was our annual "Reach Weekend" and it was great! Lots of students brought first-time friends with them. Saturday night, we had a few technical glitches that could have really set us off on the wrong foot, but our team did a great job of switching gears and going with the flow. The students had no idea that some of the stuff we had planned didn't work out. My goal for this was really just two fold: first, to give students an opportunity to put their trust in Christ for the first time and Begin a walk with him. Second, it was to take a spiritual temperature of our students, so we can better meet their needs as a whole. We don't have all the results yet, but I'm interested to see where we land and how it may effect some of our future large group weekend plans. I first played this game several months ago with the junior high team at Willow Creek. It was really fun. Then, my daughter bought it for our junior high worship leader and he says the 7th grade guys in his small group can't get enough of it. We bought ours for about $20.00 at Spencer's Gifts in the mall. 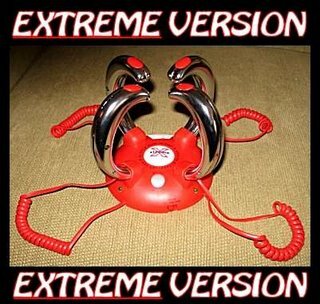 Note: This is not an endorsement of using shock toys in your youth ministry. My wife attends a large women's bible study every Thursday at church that consists of a 40 minute message followed by about 45 minutes of small group time. This year, they are working through the book of Nehemiah and Rachel has been asked to teach to large group portion which she's never done. She has taught a few times in our junior high ministry and does a fantastic job so I know she'll do great. I'm going to sneak into the back! Then, I'm off for a day of shooting pictures for our Summer calendar. The theme this year is 'Road Trip' so we're taking pictures in an old RV with goofy vacation-type props etc. Did 24 'Jump The Shark'? Jumping the Shark, as it has become known, is the moment when a television show does something ridiculous in order to keep ratings. The term originated when, on Happy Days, Fonzie and the crew went on vacation to California and Fonzie agreed to jump over a shark pit on water skis (wearing his leather jacket, of course!). I've held onto this for a few days now, knowing that my voice carries a tremendous amount of weight with millions of 24 viewers, or at least with a a dozen or so. But I feel like 24 jumped the shark on Monday night with the revelation of Jack's family. Why, Fox, Why? What was a highly improbable, but totally addicting and somehow believable show crossed the line. Will I quit watching? No. Will I remain an avid fan? Yes. 24 is like family to me and when family lets you down or does something outrageously stupid, your love for them compells you to stand by their side; to give them a chance for redemption. Oh, and what are the odds that Jack's nephew is really his son? Gee, maybe 100%????? ...but I got to chewing on something yesterday. I don't even know why, actually. Question to myself: Is my need for encouragement the result of my sin nature? My first response: Yes, I think it probably is. Without sin I would be in perfect standing with God and my sense of worth etc. would be completely fulfilled. The only reason I need someone to say, 'good job' is because I am afraid, insecure and mindful that I may do a poor job. Fear, insecurities and doing a poor job are, I think, the result of my sin nature. Then I thought: The Bible has several passages reminding us of the importance of encouragement and challenging us to encourage one another. Barnabus, is held up as a crucial leader in the early church primarily because of his encouraging nature. And then I thought: Why would God want us doing something that seemingly only serves to feed our sin nature? But, obviously, encouraging one another is a biblical principle...so maybe HOW we encourage each other is the issue. And then....well right about then I stopped thinking, put my headphones back on and turned Johny Cash up real loud. I wasn't at church this weekend so I don't know all the details, but I'll share what I've heard. We are doing a two week focus on sharing Christ with our friends. Part of the focus includes a mid-week small group video lesson we filmed. This weekend we focused on the idea that God's plan is to use people to reach others and that we need to be open to the idea of telling other's about Christ. From what I've been told, it was a really good weekend. Our attendance was huge on Saturday night, but then dropped off quite a bit on Sunday. The program went well and the team felt like we did a good job communicating the big idea. We gave each student a cheesy, little ring on the way out and asked them to wear it to school this week as a reminder to tell a friend about Jesus and invite them to church next weekend. Utilizing parents in your middle school ministry can be a puzzle. So many pieces need to fit in place: Where do they serve? Do we let them minister alongside their kids? What if their child doesn't want them there? What if their child clings to them? IMHO, developing a healthy team of parents to serve on your ministry team requires next-level leadership; leadership that takes a lot of work...leadership that lots of youth pastors are unwilling, or unable, to rise to. As a result, it seems like way too many junior high ministries are missing out on a gold mine of potential. 1) Talk to the student first. How does he/she feel about mom or dad joining your volunteer team? How (or if) you plug the parent into your ministry should usually reflect what you hear from their child. 2) View every parent as a 'case-by-case' situation. I would avoid rules such as "no parent can be the leader of his son's small group" or "Parents are never allowed to sit next to their own kid" etc. Every parent/child relationship is different and no 'rule' applies well to them all. 3) Make sure parents want to minister to all the students in your group, not just their kid. For most, a primary motive will be to spend time with their child, but if they can't give the other students in your ministry equal time then joining your team probably isn't a good idea. 4) If you aren't the parent of a junior higher, you don't know squat! You may not like hearing that, but that's what the parents of your kids are thinking about you. Instead of working hard to prove them wrong, I suggest you admit it and do the hard work of enlisting lots of parents to join your team. I think you'll be glad you did. By posting on this subject, I'm admitting that I watch American Idol with my kids...something I managed to avoid up until the last few episodes of last season. Because I actually enjoyed watching the final 12 contestants battle it out last season, I thought it would be kinda fun to watch this season with Kayla and Cole beginning with the first night. Like I said, Ithought it would be kinda fun and that's where my problem with American Idol lies...it wasn't just kinda fun, it was super fun! So, what's the problem? I guess my problem with American Idol stems from a shortcoming I know about myself: I love to poke fun at people in ways that often poke a little too deep and can be hurtful. I know people are an easy target for humor because their oddities and quirks are obvious and easy to pick out and pick on. I've known this is something I need to work on for a LONG time, but since I kinda like it when people pick on me the same way, I have a hard time remembering that most people don't. The first two episodes of American Idol were a reminder! Over the past two nights, my kids and I have spent FOUR hours laughing uncontrollably at the less talented and less attractive contestants. In fact, the goofier the contestant, the more air time they were given and the harder we laughed at them. I must have said something like "Ahhh, this guy is really trying...I feel bad that they are making fun of him on television" a dozen times last night. But then I kept on laughing. These people aren't actors, they are just normal (or somewhat normal...) people hoping to catch a break. People, by the way, who have way more courage than I do. But I have a problem with the fact that American Idol is getting huge ratings and huge dollars at their expense and is literally laughing all the way to the bank. Of course, the real problem is that I'm laughing right along with them. The people at Fox don't know any better....but I should. First, I get cold drinks at least 50% of the time and the plastic cups don't have these little jewels of wisdom (what, Mr. Starbucks, are you saying by not including cold drink drinkers? As a left-handed person who already feels discriminated against by our society I have great cause for concern over this decision.). Second, I will admit that I have read parts of almost every one of them. But I get bored easily and can't remember one that has ever kept my attention all the way to the end. Most try to be too profound and, as anybody who knows anything about me knows, profound....I'm not. But today I read the entire one because it was one that sounded familiar. I don't know if I've heard this exact quote before of just multiple versions of it. But since I actually read the whole thing, I thought it was worth passing on. Growing up, my parents always said, "You will leave this world the same way you came into it: with nothing." It made me realize that the only things we do in this world that count are those things that make the world a better place for those who will come behind us. Bilogist, herpetologist and National Geographic Emerging Explorer. Kurt's note: Dang, I understand the quote WAY more than I understand what this dude does for a living. I would expect something much more profound from somebody of his stature. Being the '24' fan that I am, I couldn't let the first four hours of the new season pass without a couple comments....there are no spoilers here for those who haven't seen it yet. - Until the last 10 minutes of last night, I was feeling underwhelmed. - It is a different Jack. I'm okay with that. - I don't like much about the current administration. If Palmer stays true to his character, he will be a problematic President. - Best line from the crowd gathered toghether to watch Sunday night's premeire: "It looks like there's going to be a Jackrifice"
I Know This Stuff Happens, But It Hurts! This happened a couple of weeks ago, but I just heard about it. We have some friends who volunteer occassionaly in our ministry who also have children the same age as ours. They have been witnessing to a family who is on their son's soccer team for several months and finally got them to agree to visit church. They have a junior high age son, so my friend said he'd go to Wildside with him and introduce him around and sit with him to make sure he had a good time. For some reason, on the way to church my friend decided that it was probably more important to sit in 'big church' with the boys parents, since it was also their first time to church (I think that was probably an okay decision). So, they dropped the boy off in our tent, and we introduced him around to other adult leaders, leadership kids etc. - The parents had always heard how great Saddleback was and how 'non churchy' it felt. Unfortunately we had a guest speaker who missed the mark, was not very dynamic, and felt pretty churchy. The parents told my buddy they probably wouldn't come back. - Their son said Wildside was terrible because he didn't know anybody and sat by himself the whole time and felt embarrased about it and doesn't ever want to come back. I'm convinced that if he would have said he loved Wildside and wanted to come back, his parents would have been compelled to give it another shot. Sadly I fear that we've lost that opportunity. What kills me most is that a church family went out on a limb to get their un-churched friends to try it out and we dropped the ball! Our music was off...we use student-led bands and sometimes they pick songs that just don't fit the abilities of that particular band, which felt like the case this week. GREAT kids on stage, they just struggled through the music. On the plus side, I had lots of discussions with students who had all sorts of questions based on their two weeks of learning about stuff we don't talk about a ton. - Playground-style picking teams is always awkward. - The working partner you don't want may be the best one for you. - Most women look better without makeup. - The boss you think is a stupid idiot may be an idiot, but probably isn't completely stupid. - When your secret gets out, honesty is the best policy. - Cameras on car dashboards are sweet! - Taking advantage of someone's loyalty is so easy, but so wrong. 1) I really like Greg. I love his passion for evangelism and his dedication to helping students learn to confidently share their faith. 2) I think the title is fantastic. 3) I love this popular, parable-style, book. Books like 'Who Moved My Cheese', 'Fish' etc. are always attractive to me. This is the first youth ministry book I've seen written in this format...unless I've missed others. 4) I think the website for the book is great. I know it's just a marketing ploy, but it made me want the book! 5) I downloaded the first half of chapter one from the website and got hooked. 6) He was kind enough to send me a free copy! Time to lock up your toilets. - I was in Colorado Sunday night through Tuesday and have never seen so much snow in my life! In 48 hours, I saw more snow than in my previous 40 years combined. - Answered prayer: Kayla's wrist is healing well. It looks like her cast is going to come off in just a couple weeks. - I'm not 'pro war' but it seems to me that the only way to a) get out of Iraq quickly and b) to get out victoriously (not even sure what that means), would include a big increase in troops, fire power. Of course an all out withdrawl would get us home very soon, but I'm not sure that would leave the people of Iraq in a very good position. Gosh, I really do hate the whole, stinkin' mess! - If a junior higher spends 10 minutes a day in quiet time and reading the bible, it adds up to 5 hours... or 1/2 a day each month! Not bad. - For some reason, the new iPhone isn't all that attractive to me. - Only 4 days til 24! I realize I'm opening myself up to take a few hits on this one, but that's okay. I'd love to hear your thoughts on teaching a tough topic to junior highers: HELL. As I mentioned in my Weekend Wrap Up, we are doing a two week series called What's Next? Week one is a look at hell and week two will be a look at heaven. Below is my outline from last weekend's message. Sooner Or Later, Everybody Asks: WHAT HAPPENS WHEN I DIE? Hell is not INTENDED for YOU! HELL Is No Place To Call HOME! After two weeks off, we came back pretty strong. Students were excited to be back and there was a lot of energy. We had a fairly simple program but a strong one. The music team was one of our best in a long time. The message was hard to teach (an entire lesson on hell...), but I felt pretty good about it. I have recently gone on record as saying that The Office was my favorite show last year. 24 is still my favorite show of all time, but The Office seemed like the best show last year. In honor of The Office, I will occassionally post things that a current episode has taught me. If you haven't seen last night's episode yet, quit reading now. 1) 40-something white males should never put beads in their hair (note to self). 2) Email travels much faster than we can run down stairs. 3) Petting zoos may, in fact, sell livestock for human consumption. 4) Steel drums are harder to play than they look. One of our ongoing problems in our ministry is the calendar. Who's doing what? When was that due? Did we cancel such and such? Somehow we've never really been able to create a good, team-wide master calendar. Until now. The picture to the right is our attempt at organizing our team calendar. We stole the idea from Josh Treece, and customized it a bit. 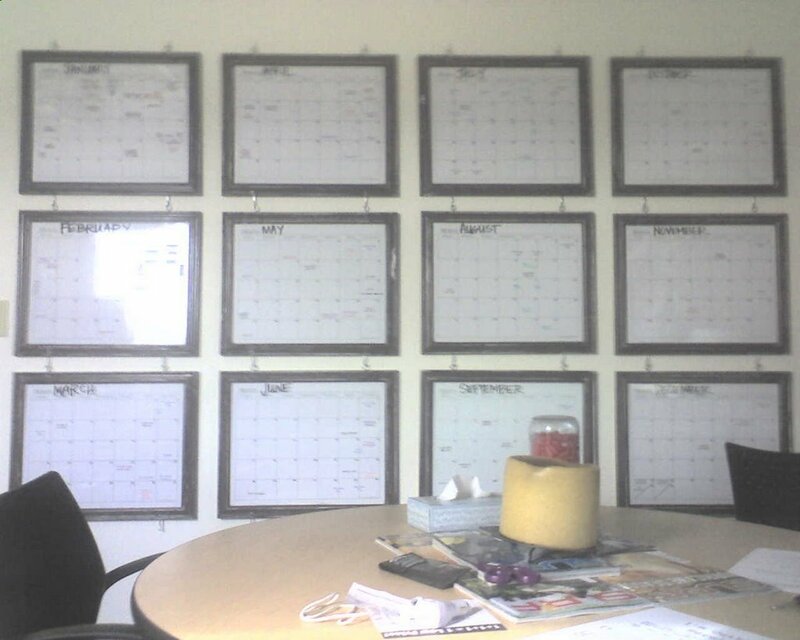 It's really nothing new, just a big wall-sized calendar in our 'Surf' Office that will serve as our master calendar. We even pre-printed a bunch of color coded magnetic stickers with events, activities, recurring dates etc. that we can use to keep it looking tidy. They are each hung separately and can be moved and re-arranged in any order we want. Everybody can look at the calendar, but only one person is allowed to make changes. If you want to add or delete something from the calendar, it goes through the proper channel first so she can make sure that the calendar on the wall truly reflects the 'master' calendar in our church-wide system. The bummer is that my 20-year excuse of "gosh, I forgot to look at my calendar" will no longer be acceptable. - The third and fourth books of the 'Middle School Survival' series that I'm writing with Marko. The first two, My Faith and My Family, turned out to be surprisingly good and I'm thrilled to start the next two, My Friends and My School. 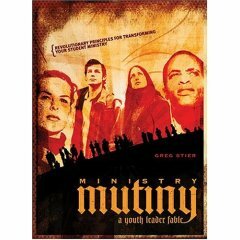 - Group Publishing is releasing a new Youth Bible (or maybe a re-released version of a previous Youth Bible....?) and have asked me to contribute in several areas. I really don't feel like I have the time for an additional project, but I also feel like the opportunity to contribute to a Bible project is one worth pursuing. Helping teenagers dig into God's word is worth a little extra work, isn't it? - Our junior high team at Saddleback is losing a key member due to the fact that she fell in love with and is marrying one of our interns who is from Oklahoma! This means I am beginning a search for a female associate to lead our small group ministry which is a huge role. - We have what seems to be a bigger than normal amount of students and volunteers going through health, family, and personal turmoil. - My daughter broke her wrist over Christmas break (She wiped out on a quad...). She's fine, but stressed because it's her writing arm and school is going to be a challenge. - My fourth grade son is very strong-willed, which brings a lot of positive qualities as well as negative. Lately, our family has been experiencing more of the negative than the positive. I’m sure most of us are able to claim one or more of these as our own personal resolutions. I know I can. I have kept only a few of my New Year’s resolves. It certainly makes me a better person just to reflect on and evaluate my life each year and for that there is no doubt a little improvement in some areas.However, I am through with any medium to high expectations that may come through my New Year’s resolutions. Life is too short to count on resolutions to make significant changes in my life. Resolutions can only REFORM what I already have going for me or not going for me. In 2007 I am for revolution. Revolution can TRANSFORM my life.In Diana’s favorite verse, Psalm 51:9, it is very clear what David is asking for. He says, “Create in me a clean heart, O Lord.” He isn’t making a resolution to change his heart nor is it a prayer for God to change or reform his heart, but to create in him a new heart. I don’t want Jesus to change or reform my old heart, filled with habits that just aren’t working or moving in the right direction. What I need is a TRANSFORMATION—a new heart altogether. I want my heart to be beating with the heart of God. I want to be transformed. By the way, I've seen this work in Diana's life and it's not only transforming; it's beautiful!RESOLUTION is just another DO-OVER, reforming and refashioning my old stuff. What I want and need is a REVOLUTION—a spiritual heart transplant by the best heart surgeon in the universe. His name is Jesus. 1. Place your name on God’s heart transplant list. Pray continually for God to “Create a clean heart” within you and mean every word of it. You have to be totally desperate to be put on the list for a heart transplant as my friend Don was. But for God’s heart transplant you must not only be desperate (that’s a given); you must want it with everything that is within you. 2. Plan a daily transfusion. A transfusion literally is to pour something from one container to another—to spread throughout something and affect every part of it. You need to transfuse your life every day (preferably morning) with Jesus. He is the one who has created everything and holds everything together, so why not connect with Jesus every day—to what He said, what He did and what He is saying and doing today. (1) Read a paragraph or so out of the gospels (Matthew-Mark-Luke-John). Listen or read the Acts 29 Daily, read a chapter a day of the Acts of Jesus. (2) Lay out to Jesus what you are thinking and what you want. (3) Take the time to be quiet and listen to His answers back to you. 3. Make appointments with other heart transplant patients. Don’t even think about walking through life’s stresses and difficulties alone. You are not strong enough to handle all that is thrown at you AND you will tend to forget the revolution is still on here on planet earth. 4. Wait for further instructions from your doctor. Jesus is eager to set up all sorts of divine appointments for you. These divine appointments will be a variety of orders from Him and opportunities that only He could set up for you. Jesus will make the appointments. All you have to do is SHOW UP.Don’t just make New Year’s resolutions this year. Make some direct and determined moves toward a personal revolution in your heart. Instead of being resolutionary about your life; be a revolutionary.Jesus is and has always has been the greatest revolutionary—turning the world upside down by turning people inside out. And don’t forget, THE REVOLUTION IS STILL ON! As we head into '07, I thought I'd make a super short list of some of my favorite things from the last year. FAVORITE FAMILY OUTING: Dirt bike riding...it's the only thing we all enjoy.